Five years have already gone by since Leo took his first stroll around the A. G. Leventis Gallery. This year, the Gallery is celebrating this special anniversary by inviting our young friends, aged 4-12 (kindergarten and primary 1- 6), to take part in a one-of-a-kind art competition. With the opening of the A. G. Leventis Gallery, Leo – the mascot of the Coco_Creativity Centre and of the Gallery’s Educational Programmes – was born. Over these past five years Leo has accompanied thousands of children in the Gallery and has had memorable moments with them amongst the great artists of our Collections. However, he has begun to feel lonely and has been asking for the company of his beloved sister. The A. G. Leventis Gallery team has decided, on the occasion of this anniversary, to invite his sister to join him. Now, together, they can host even more children and create new, unforgettable experiences! Leo’s younger sister is called Leonie and she is six years old. She loves drawing, flowers, the sea and cats, but she also likes football, singing, dancing and the theatre. We are inviting our young friends to bring Leonie to life in the form of a drawing, so that Leo won’t be lonely anymore. Grab a paper and some coloured pencils – and any other materials you like – and draw Leonie just like you picture her in your head. Let your imagination run wild through the winding roads, the Impressionist fields and the beautiful outdoor scenes that the great artists created. There you will find your inspiration! Take a walk through the Collections of the A. G. Leventis Gallery and talk with our staff, your parents and friends! We can’t wait to admire your works of art and meet your version of Leonie. 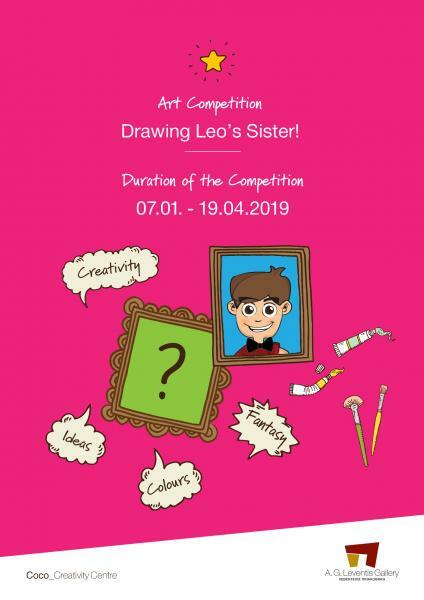 The winner’s drawing will become the second mascot of the A. G. Leventis Gallery’s Educational Programmes along with young Leo. The first three winners will be awarded free participation for one year in all the educational programmes of the Coco_Creativity Centre and receive a Gallery member’s card for five years. The first-prize winner will also receive Leonie as a soft toy. The winner will be announced on 18 May 2019, a date dedicated to celebrating museums around the world. A selection of the drawings will be exhibited in a unique way at the A. G. Leventis Gallery on 18 May 2019. 1. Take a sheet of A4 paper. 2. Draw young Leonie the way you imagine her! 3. Send us your artwork along with the registration form, which you will find here.